GigaVoxels/GigaSpace is a GPU-based library for the efficient rendering of massive scenes and objects (i.e. very detailled, large or crowded). Data is encoded as SVO - more precisely, octree of bricks - automatically loaded or generated on GPU at appropriate resolution whenever visible, then kept in a cache on GPU. Only what is seen (and at appropriate resolution only) is produced, stored and rendered, so that it always fits memory and renders efficiently. Our voxel cone tracing is basically a 3D MIP-mapping. As such, it accounts nicely and cheaply for anti-aliasing and continuous LOD transition, and the technology also permits nice and cheap rendering effects such as soft shadows, depth of field or multiple scattering - the blurrier the better, right oppositely to classical algorithms :-) . The user just provides (or choose in our toolkit) a data-type, a ray-renderer function and a producer callback function (that might be half on CPU and half on GPU). Interoperability with OpenGL is easy (we provide plenty of examples). Moreover, a GLSL version of the GigaVoxels renderer is available, e.g. for direct integration within the pixel shader of some complex material. Indeed, GigaVoxels/GigaSpace is also a lot more than this. It can do simple things simply, but is deeply customisable, and can also process non-voxel data (points, triangles, ...), rely on various hierarchy schemes (BVH, BSP, ...), and even be used for other tasks than direct rendering (collision detection, points sorting, textures...). Footnote 1: For the cache to fit, the asumption is that not all data is simultaneously visible: either one can see a few (front stage) at high resolution or a lot (back stage) at low resolution. Cluster of opaque objects (possibly with fuzzy skin) in transparent medium is perfect - the denser the better. Huge fully semi-transparent 3D continuum is bad. 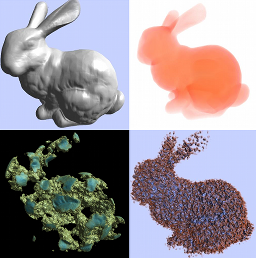 Footnote 2: Multiple scattering is not implemented in the toolkit, but illustrated in the article "GI-voxels". GigaVoxels/Gigaspace distributed under the BSD 3 free software license, for non-commercial as well as commercial use. As a research center INRIA cannot ensure long term software maintenance, but a community out of INRIA might help you on, and INRIA might be able to answer or redirect concerning special needs (e.g. development, formation). For both, see contact.